Arrive in Delhi, the capital city of India. Meet our representative and transfer from airport / railway station to your prebooked hotel (check in/out 12.00 hrs). Let New Delhi Hub take you on a historic journey through the seven cities of Delhi. Travel through time with New Delhi, as you tour the monuments of Quila Rai Pithora, Mehrauli, Siri fort, Tughlakabad, Firozabad, Shergarh, and Shahjehanabad in Old Delhi and the gracious tree-lined avenues of New Delhi. Peel away the layers of history with New Delhi Hub and enjoy the museums, art galleries, shopping malls, parks and modern attractions of New Delhi. 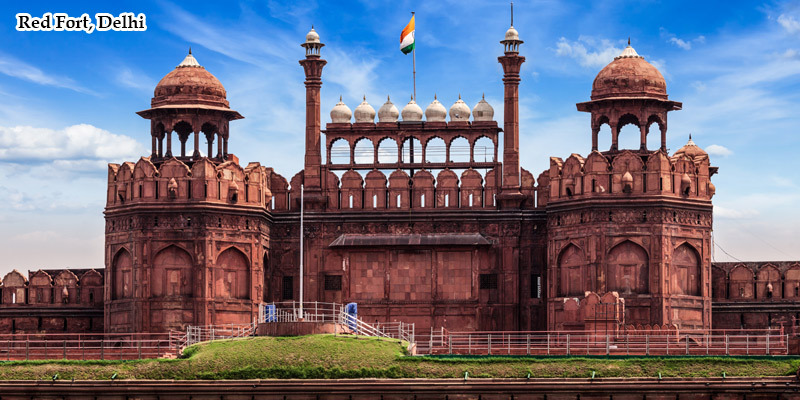 Taste traditional North Indian cuisine, shop for handicrafts and textiles and see history and modernity combine, in India's fascinating capital city, with New Delhi. You can visit the Old Fort, one of the most visited tourism destination on your New Delhi tour. The fort is located on a small hill, which once stood on the banks of the river Yamuna. Legend has it that the fort marked the site of Indraprastha, the magnificent capital of the Pandavas, though Sher Shah Suri carried out the construction sometime between 1538 to 1545 AD. The structure houses a mosque, which has a double storied octagonal tower. The popular bazaars of Chandni Chowk form a part of tourism destinations in New Delhi. A trip to Delhi would be incomplete without a visit to Chandni Chowk, in Old Delhi, where shops and stalls display a wonderful array of goods. India Gate is one of the most popular tourist attractions in Delhi. The impressive colonial architecture of India Gate is a symbol of modern Delhi. The beautiful stone arch was built by the British in honor of Indian soldiers killed in World War I. Here you will also find the 'Amar Javan Jyoti', which is a permanent flame in honor of the Indian soldiers who died in wars since 1918. It is a lotus shaped structure made of marble, cement, dolomite and sand The temple is located in Kalkaji in the south of Delhi. You can visit the Lotus Temple on your tour to New Delhi. The temple is open to all faiths and is an ideal place for meditation and obtaining peace and tranquility. On New Delhi tour you can visit the popular shopping area of Janpath at Connaught Place. Here you will find all items from jewellery to paintings and furniture. Nearby Janpath there are many government State Emporia popular which affords a glimpse of the handicrafts of each state. So does the recently- inaugurated new Central Cottage Industries Emporium on Janpath.